Can you imagine how amazing? I almost can, but not quite. Also, where else but the Castro could a soirée this awesome be found? Also, commenters Mike and Gerard shared video from the party. Wild, fun times. $52.22 in today’s money. Take $2 away for the fare (Church to Castro … riding the subway literally to the party), and you’re talking $50. Not bad. And I know absolutely nothing about current music to even venture a guess at who’d play today. Actually, he was singing “I Will Never Stop Dancin'” not “You Make Me Feel Mighty Real”. I guess you weren’t enough of a Sylvester fan, even if it was FREE !!!! The GLBT Historical Society in San Francisco has footage of Sylvester performing at the Castro Muni Station opening party. Here’s a clip from the society’s YouTube channel: http://www.youtube.com/watch?v=XnK6ai8KkvM. Thanks for posting this. What were the blue ticket/red ticket things in the film? Was that a Muni fare sale, or something like drink tickets for the event? Thanks, Gerard and Mike! That brought a wide smile to my face. Okay, so what. Muni still stinks and this was another event aimed at one special interest group. Metro – the ride of the futere. The next day it was just antoher Muni bus with not so great people. thats when San Fransico was mostly white. and the city was liveable. More livable perhaps but not because it was more white. Just fewer bratty young folks with cars and attitude. And fewer doublewide strollers. And fewer cyclists ignoring traffic laws. Actually, San Francisco was probably more African-American then, maybe about the same Latino, and probably a little less Asian. I love this city,and I love the mix of people in it. If you don’t, feel free to leave and make room for someone who can appreciate it. Now where can I get a copy of this poster? Wow! I want a copy of this poster as well! The original idea was for the party to be held in the Castro Street Station (perhaps with a temporary wooden platform over the tracks at this side-paltform station), but there was some construction or other reason that this couldn’t be done. Instead, people boarded at Castro Street for a ride to Van Ness, where the party was held. Parked Metro trains on both sides of the center platform kept dancers and other partyers from falling onto the tracks. Several of the Metro cars (the original Boeing-Vertol type) were used as coat checks. When the party was over, you couldn’t go back to Castro by train (too late for the Muni drivers, overtime issue maybe? ), so a bus bridge ferried people back to Castro Street. I was there. It was a great party. Joe Kennedy was there, too, campaigning for his uncle Ted’s 1980 presidential bid — the California primary was only a few days off. The first reports of AIDS were still a year in the future. amazing, A Vuncular. Thanks for sharing. I was dead set on using the Castro station somehow for the event, and I got Muni to agree to run a shuttle between Castro and Van Ness for attendees. People entered the Castro station and boarded the LRVs, which whisked them to Van Ness. I had mannequins installed on the Church station to look as though there were people waiting for the train. I asked Christopher Grubbs, then a budding architectural illustrator, to design the poster and invite. Chris is now a world-renowned illustrator. This is the poster above. I was pleased to see it scanned for this flashback.The invite was a precursor to the club cards now distributed on Castro & 18th. (AKA Punk–Mabuhay Gardens on Broadway) Howie Klein–now at Warner Bros) and the late great DJ Larry LaRue of Stud fame. It was the battle of dying disco and rising New Wave. The two DJs followed each other’s sets’ alternating genres and the crowd loved it. Flicka McGurrin–now owner of Pier 23 Cafe handled the bar–yes the two colored tickets were for the bar drinks. Since the Metro system was set to open at 5am the next morning we had to strike the set by that time, so it was a very long day. My assistant Doug Jackson and our group worked straight through 48 hours. I had the party video taped and that master is now in my archive at the SF Public Library. I was invited to screen the video of Metro Madness at a video event at fnac in Paris. I think the French liked the title Madness and they adore their Metro. I had sent Doug Jackson to Budget Signs, then out on Geary Blvd for event signage where he met Mark Leno. The two fell in love and were together for many years, until Doug’s death due to AIDS. Metro Madness is still one favorite of my various projects over the years. 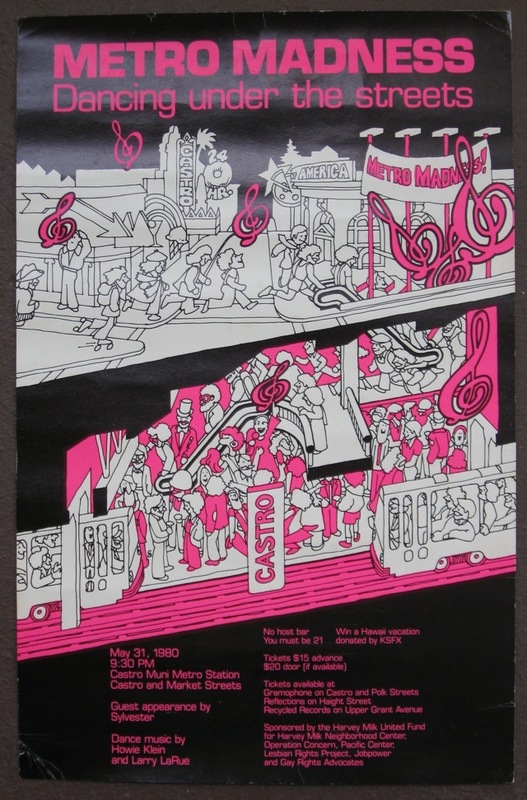 The Metro Madness poster was created by a dear friend, gay illustrator Chris Grubbs. Thank you Ken Maley for having a good memory! I remember it as a great party, and Sylvester, and the lines of parked streetcars and not much else. Wasn’t there one of those giant rope-macrame sculptures on the end wall behind the stage? Seem like over the years it got filthier and filthier then it disappeared. I wonder where it went?